More than 8 billion videos are watched on Facebook every day (you heard right), and recent stats are showing that video content gets 135% more organic reach than photos posted on Facebook. Video content is one of the most influential forms of online content today. It is an effective way to connect with your target audience in terms of engagement. 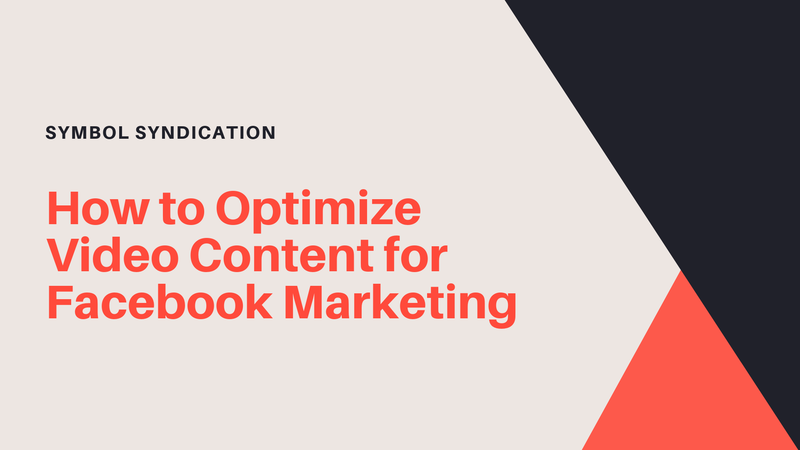 However, if you want your video content to reach its full potential then you need to ensure that your video is optimized for Facebook. Facebook’s main goal is to keep people on their platform, longer. Although the Facebook algorithm is making it harder to increase organic reach, they favour a native video (one that has been uploaded directly into Facebook) over linking out to another video on another website (i.e. linking to youtube). So if you’re looking to increase engagement on Facebook don’t just link to YouTube videos — upload to Facebook itself. Symbol Syndication Tip: Nothing looks more unattractive than a bad video thumbnail (think of all those times when someone took a candid photo of you while eating. Ya, that’s basically what a bad video thumbnail is like). When you upload your video, Facebook will automatically compile 10 thumbnails from the video for you to choose from. If none of them look good to you, you can also upload a custom thumbnail of your own. If you want to convince your audience to hit play, you’re going to need an interesting, relevant thumbnail image for your video. Compared to YouTube where users are watching and listening, 85% of videos on Facebook are viewed without sound. Think of the people in transit, waiting for an appointment. Add context to your video content by incorporating closed captions. When you upload a video directly into Facebook, it will automate captions for you based off of the audio in the video, just make sure to review and edit the captions before publishing. Utilize the title and description. Seriously, do it. Don’t neglect the text portion of your Facebook video post which serves as the click-bait. If you want people to actually watch your Facebook video content, you need an engaging title and description. It’s that simple, yet so many people underutilize this feature. Your title and description should be about the topic of your video and include any keywords relevant to your video. Remember, you want to make sure both are highly compelling in order to interest viewers to stop scrolling their feeds and watch your video. In today’s world, it’s quality over quantity. We simply don’t have the attention span nor the capacity to sit through endless amounts of content being thrown at us every second of the day. Your social video strategy needs to reflect that. The maximum length of a Facebook video is two hours, but Wistia found the optimal length to be two minutes or less. Edit your video into a 1:1 ratio – the perfect square. Why? Because you want to take as much real estate up as possible on Facebook. In the mobile version of News Feed, square videos take up 78% more screen space than landscape videos. It’s simple really, the bigger your video, the harder it is to ignore. Last but certainly not least, always always always include a call to action within the video and/or post description. You’ve just spent time (and money) developing a social marketing strategy that utilizes video content, why wouldn’t you ask users to take a specific action after watching your video?? Keep these practices in mind when you’re planning your social strategy to ensure you’re getting the most out of your video content. If you have any questions or need help getting started, please send us a message – we are always happy to help!